If you are looking for an air purifier that will effectively filter the air in your home or office, you will quickly find that making a purchase is easier said than done. The market is oversaturated with purifiers of all sizes, shapes, prices, and features. So, rather than guessing which air purifier to buy, we have reviewed the SilverOnyx 4-in-1 air purifier so you know exactly why you should consider it. This air purifier has a HEPA filter as well as a mesh pre-filter and an activated carbon filter which offers you full protection from particles and odors. 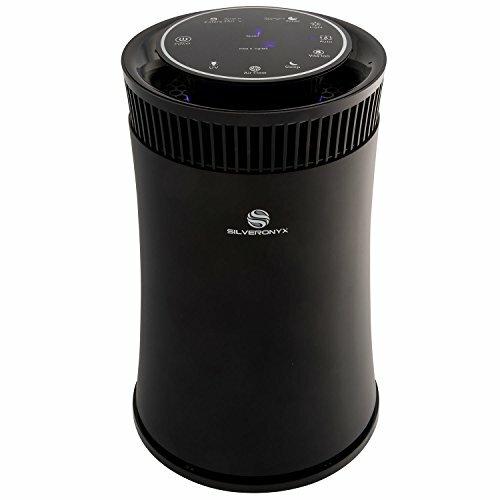 This attractive SilverOnyx air purifier weighs just 5.35 pounds, but what it lacks in size it makes up for in power. It can filter the air in rooms up to 600 square feet. The HEPA filter eliminates up to 99.97% of pollen, dust, and other airborne particles. Plus, the integrated air ionizer removes any floating bacteria and reduces any buildups of static electricity. For those who struggle with allergies due to smoke, pollen, dust, mold spores, or animal dander, particularly in the springtime, this air purifier may be just what you are looking for. But, if you suffer more from other indoor air pollutants such as bacteria and viruses, this purifier may not be ideal; however, it will still work thanks to the ionizer. The air purifier comes with an activated carbon filter, a true HEPA filter, and the user manual which provides clear guidelines on how to use this product to the fullest. This unit has five filtration stages that ensure that only the purest air is being filtered into your home. The mesh pre-filter captures the larger particles such as pet dander and hair. The HEPA filter then removes 99.97% of fine particles like dust and pollen. The activated carbon filter eliminates odors and removes chemicals. Negatively charged molecules that are attached to airborne allergens are released by the anion generator. Lastly, the UV-C light destroys microorganisms and bacteria in the air. The combination filter cartridge has a mesh pre-filter, a HEPA filter, and an activated carbon filter, while the UV-C light and ion generator purify and sanitize the air even more. 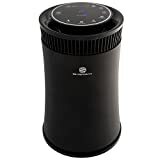 This air purifier is only 10.3 inches tall, allowing you to effortlessly find a convenient spot to put it. It is lightweight and compact so you can move it from one room to another with ease. This unit is also available in black, white, and silver so you can find one to match the color scheme in your home. This purifier has five fan speeds for effective air cleaning in any situation. The air quality sensor can automatically determine how much contamination is in the surrounding air and will adjust the fan speed accordingly when in automatic mode. In auto mode, the device will shut down once the air quality has reached the ideal quality. This model also boasts a PM 2.5 (particulate matter) sensor that automatically adjusts the air flow so that the highest level of air quality is maintained at all times. The SilverOnyx air purifier has a 100% money back guarantee so you can rest assured that if you do not like it or it does not work to your standards, you can get a complete refund. You can control the ionizer, 5-speed fan, UV light sanitation, on/off timer, sleep mode, and auto mode using the easy to use button display on top of the air purifier. If you don’t want the LED light to disturb you while you are sleeping, you can easily turn the display and indicators off in dark conditions. This air purifier by Blue Pure eliminates 99% of airborne pollutants including dust, mold, smoke, pollen, and pet dander thanks to its specially designed filter. The activated carbon filter also ensures that any odors caused by pets, smoking, and cooking are removed. This product is a top rated purifier for the lowest sound output so you can enjoy quiet operation. It is also energy star rated for having the best energy performance in its class. The pre-filter is washable for larger particles, and the 3 fan speeds can take on large living rooms, bedrooms, offices, or kitchens. This purifier is designed for rooms up to 600 square feet. This brings to an end our review of the SilverOnyx 4-in-1 air purifier with its 600 square foot purifying abilities. Although SilverOnyx does not specialize in air purifiers, they did a great job when producing this model. The five fan speeds are a huge plus that clean and maintain the air quality very well and the true HEPA filter ensures air purifying at the highest level.